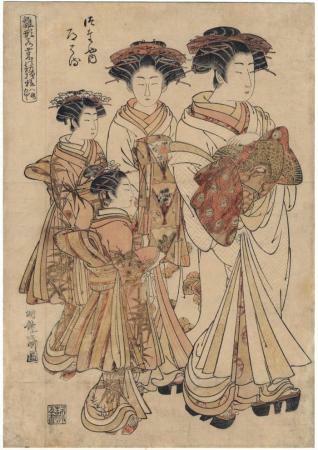 The curatorial notes on this print at the Honolulu Museum of Art reads: "The Tayü (leading courtesan) Michiharu of the brothel Tsutaya is depicted in a procession with three attendants. An inscription reading “White garments of the eighth month” suggests that it is summertime, which is exceptional for the series. As in the other prints from this famous series, the töröbin hairstyle of the beauties helps date the series to the second half of the 1770s. The obi (sash) shows the gorgeous design of a peacock. This series represents the pinnacle of Koryüsai’s artistic achievement. (from "VOGUE in Japan: Edo Fashion through Japanese prints" exhibition 07/30/08-)"
Richard Lane in his 1978 Images from the Floating World gave a harsh assessment of Koryüsai’s Hinagata series. "The most renowned works of Koryüsai’s later years are his extended series of large prints featuring courtesans with their attendants. The best of these are effective compositions and impressive prints but they are hard to love. Gone is Harunobu's happy influence: these prints are characterized by a tendency toward sharp, often sometimes gross realism." While Lane was following the lead of Seidlitz in criticizing this series at the end of the 19th century, others, including Hashiguchi Goyō praised this series. Allen Hockley devotes an entire chapter of his book on Koryüsai to his Hinagata series. Listed in Hockley, p. 231, #61.